Quinnipiac is a tricky one for me because I enjoy both versions of its home and away uniform and also like the uniqueness of not having a true ‘white’ sweater. The biggest problem lies in the Bobcats’ third alternate sweater and even though I don’t know exactly how many times it was worn, I feel as if one was too many! We’ll get back to those in a second. Quinnipiac is a funny word to fit on a hockey sweater, but for whatever reason, I feel like that name is a PERFECT fit for a script mark and have the logo act as more of a shoulder mark. Although I think its askew logo fits in well with such a long name, I think less would be more with Quinnipiac’s overall look. The piping on the socks and sweaters don’t match and I’m not saying that it’s a must … but it’s just a lot to look at with what I count a combination of FOUR different logos spread out through the three offerings (shoulder, pants, helmet and jersey). The camo look? Yikes. I appreciate trying to think differently, especially if it was a tribute of some sort, but just plopping that clumsy Q on it is pretty garish. If I was new to the game and saw them playing in that, I’d have no idea who I was there to see. The color combination is strong and the hockey lace in the chest look is fine for these. I also think it’s pretty unique how the piping on the lower half of the jersey is different for both home and away offerings. 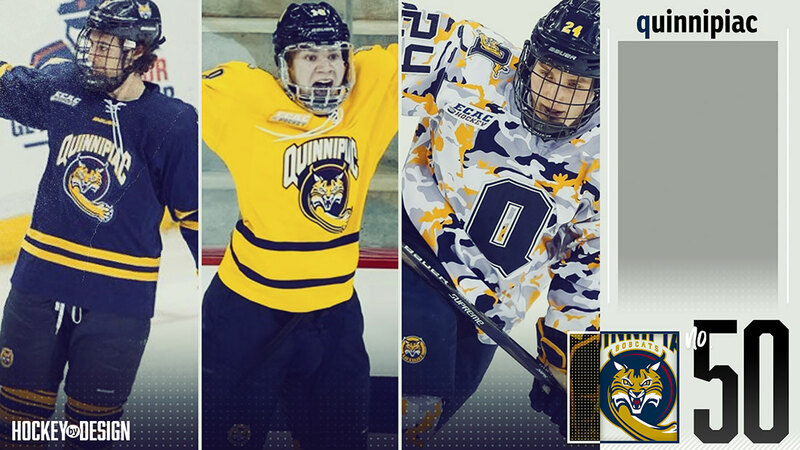 There are some nice elements here, but all in all, less would be more with Quinnipiac’s overall look. Rensselaer clocks in at No. 49 after offering up a pretty vast array, including a very cool “Black Friday” sweater. Let’s jump right into that. RPI’s SID, Perry Laskaris, informed me that for the Engineers’ first ECAC Hockey game of the year, they will wear a one-time jersey that gets auctioned off, calling them the ‘Black Friday’ jersey. Pretty sweet. Interested to know if any other program does something of that nature!! As for the Uncle Sam theme? I’ll be honest, I’m a liiiiiiiittle confused but hey, it’s different! I think the best part of the “Made in Troy” nameplate on the back of the uniform. 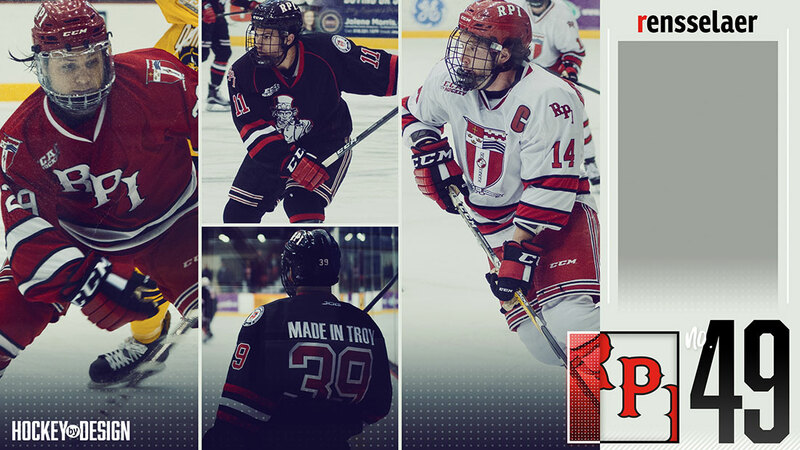 For those that have never been, RPI is in town just outside of Albany, N.Y. and has a very proud hockey culture and community. I think it’s really cool that the program is very open to embracing what it’s from. To the main red and white offerings: the red RPI uniform is honestly one of my favorites in all the land. That diagonal “RPI” diagonally etched across the chest is an iconic look. Branded perfectly and I instantly know who I’m dealing with when facing the Engineers. I love how they use the school crest on the shoulder patch and wish more schools did that (think it looks great on the Black Friday ones as well). My only problem is that because it’s such busy school crest, I just don’t like how they turned out as a primary mark on the white offerings. It’s a little nitpicky, but for me, this is better served as a secondary or tertiary mark. The font of the captain’s “C” with the RPI mark and the large school crest is just a lot to look at. The other thing I’m not wild about on the red and whites is the stripes. I think if you thinned them out a bit and placed them closer together, you’d really have something but it makes it a lot to take in. Then you add the amount of striping to the hockey pants and it becomes a very busy package. 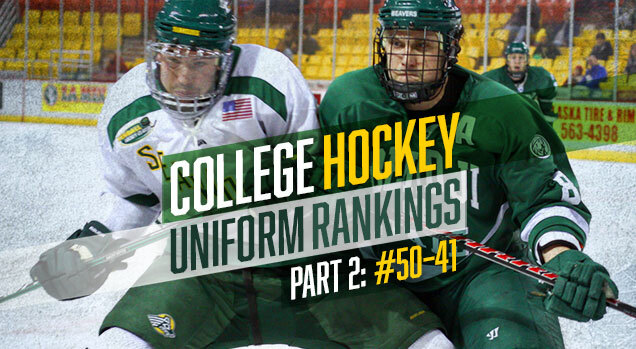 If we’re being honest, RPI would be in the top 20 if they reincorporated Puckman into the uniform somehow! Either on the helmet or as a secondary mark, but Puckman is too iconic of a mark to leave off! I hate to have Air Force so low on this list at No. 48. 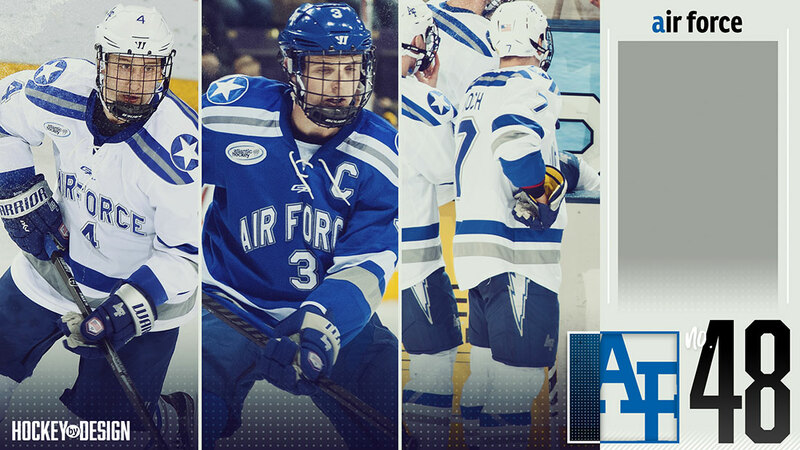 Not because I think they have a bad look, but because I think Air Force is one program in the country that you could do SO many clever and unique things with. The other service academy in this list, in my opinion, has done a much better job with this. The Falcons offer up a clean, consistent look with a bold color combination, but it just doesn’t do much to get me all that excited. It’s branded well and I know who we have in the barn, there’s just a lot left to be desired I feel. If you even simply Wikipiedia U.S. military aircrafts, there are SO many incredible markings, you’d tear your hair out wishing some of these things were incorporated. My biggest gripe is how the circle-start shoulder patch is evenly set in the shoulder piping on the away blue sweater, but overlaps the stripes on the white. I’m not sure if there’s a story or reason behind that, but I feel as if that should be consistent. Yep, the pants are cool. I love the Air Force lightning bolt but I feel like it could be even more prominent through. The team name, number and player name plate are all cleanly constructed, but it’s just kinda bleh. A little too bland for me. I very much appreciate the ‘AF’ logo on the helmet which is another true marking of that athletics department. And finally, we crack into the Hockey East Association, a league in which I am very familiar. Not to offend my dear, sweet friend Chris Aliano, noted Merrimack hockey SID and psychotic NY Mets fan (who have GREAT uniforms by the way), but someone had to be there. 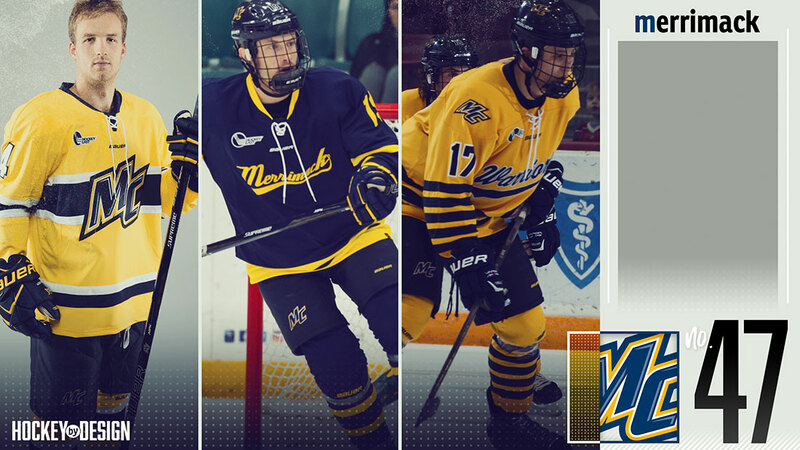 There’s a lot I do like about Merrimack’s overall look. They’ve done an excellent job rebranding as a whole throughout the department – just a few small tweaks would land them out of the Hockey East cellar. Much like Quinnipiac, they do not have a white offering (I’m almost positive they had one way back when) and go with the blue and golds just like the Bobcats. Let’s start with what I do like: I think the Warriors’ script on the third alternates is pretty unique. The FIVE (!) stripes to match, on both the sweater and socks, isn’t something you see every day – and for a third uniform, I say why not! If you haven’t learned anything yet, I’m a sucker for script on a hockey uniform and I like the aesthetic of it on this uniform, particularly with the white stroke. Let’s take the flipside, unfortunately. There’s something off on the blue script uniforms. Whether it’s the absence of white coloring (save for the V-neck hockey lace) or how small the script mark is or just the overall plainness of it, something seems amiss with it. If one thing is consistent throughout all three, Merrimack’s main logo is incorporate. The problem for me is that the odd skew to it makes for a horrible main insignia, front and center on a jersey, much like it’s emblazoned here on the main gold uniform. The ‘MC’ mark is the definition of a perfect secondary mark on the shoulder or pant (as they have it on all three), but for a main logo front and center on the uniform, I’m just not a fan of it. If the Warriors script look and feel was adopted across the board and even applied to the name ‘Merrimack’, I think we’d really have something here. It’s hard to say, “I don’t really like Omaha’s uniforms” but I’d be hard-pressed to find someone that goes “Oooooh! 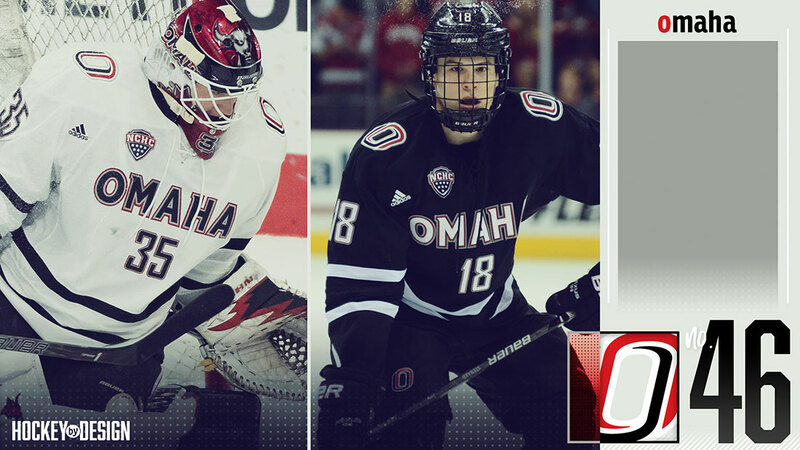 Did you see what Nebraska Omaha was wearing?”. That’s just the problem. There is nothing that really sinks these uniforms, but at the same time, there is nothing memorable about them, either. I believe the Mavericks only had two offerings last year: the whites and the blacks. They appear to be almost a complete mimic of one another, just flipped the piping color. Here’s what I absolutely love about Omaha. That logo is fantastic. Somehow, they managed to turn a U, an N and an O all into a slick-looking oval. The U is fashioned in black, the N in red and all together, it forms an O. That’s awesome. The other thing I appreciate about it is how that logo is used. Like I talked about with Merrimack, I think the skew to it would look odd if it was bigger and centered on the front of the sweater. It’s bold enough and gets the point across on the shoulder and it’s noticeable enough to stay as it. 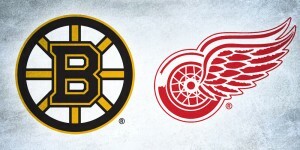 Bravo to the logo artist who pulled that one off. The rest of the uniform though is just…it’s there. Omaha on the front – number directly underneath Two stripes on the bottom and on the sleeves. Done. The ‘Omaha’ wordmark is also much thicker than the number, which is okay, but the number font selection, in my opinion, isn’t great. It’s like one of those generic number fonts you’d get in Microsoft Word or something – I think if the number matched the top, it would look better. All in all, I appreciate the simplicity, but in the end, that’s also kind of Omaha’s downfall. If the Viking helmet was a full-time incorporation, it would be difficult to not have the Lakers in the top three, but something tells me the Atlantic Hockey officiating crew might not let that one fly…but I digress. Mercyhurst – a bit of an enigma for me because I absolutely love some elements of its look but others offset that sentiment. One of the criterion I set forward was “does it have a collegiate feel?”. Mercyhurst may have one of the most collegiate-looking sweaters out there. Anytime you can fashion a “Y” into a hockey stick, you do it. (looks at Yale). 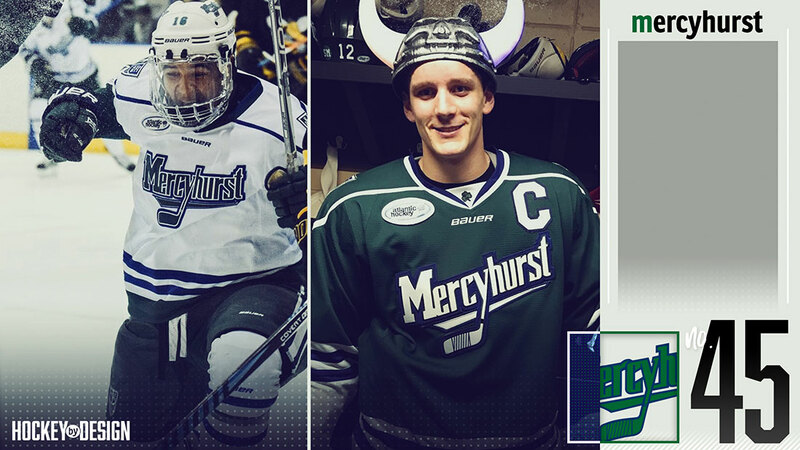 In most instances, it would probably look stupid, but Mercyhurst has owned this brand for awhile now and I think it’s pretty crafty. 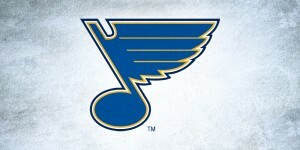 It even justifies that upward wordmark on the front of the uniform that I’ve been critical of on other teams. In addition to a beautiful, bold green coupled with a sharp navy/royal blue combination, I love the solid block of color at the base of the jersey complimented by the two stripes just above it. You don’t see that look often and I think it works well here, particularly on the white uniform. You can see it a bit on the white uniform, but the Lakers have done a nice job of incorporating the school’s crest onto the shoulder and the pant, which is something I’m always going to be a fan of. Where Mercyhurst loses me is that thin, ovular piping that goes around the shoulders. I’ve always felt that look is the definition of “we need some striping on the jersey, but just not sure where to put it – eh, I guess this will work”. I just think if the uniform stands well on its own with a sharp wordmark, than keep it off! 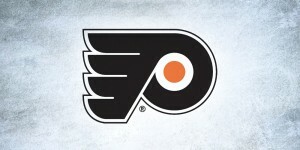 I enjoy the color combo and wordmark, but I think they’re strong enough to stand alone without any additional baggage. You have to hand it to Yale. They might be the most consistent-looking bunch amongst the 60 as the Bulldogs only possess two uniforms and they are exact mimics of one another. White for Ingalls Rink – Blue for the road. 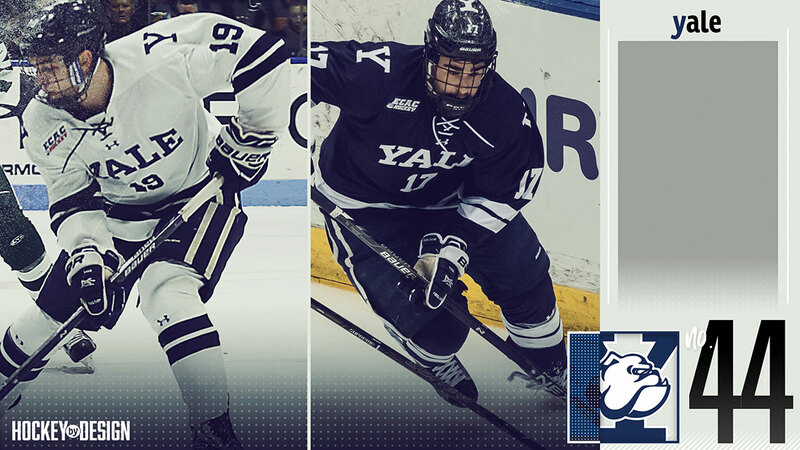 When you take an overall swath of Yale’s uniform, it almost gives off that Nebraska Omaha “eh” feelings, but when you have a gander at the “collegiate look and feel”, Yale most certainly embodies that. Since Yale signed on with Under Armour, I feel that ‘Yale’ marking lost a little bit of its kitschiness but that’s just me being very particular. In regards to symmetry, this is the poster child for college hockey uniforms or, any uniform, for that matter. I’m also a ginormous proponent of a two-color uniform throughout if it works. For Yale? It works great. I like Yale’s bulldog logo and that isn’t necessarily present on these, but that’s okay. I think it would make a strong addition as a marking on the pants, if anything. One unique thing Yale does that no other college hockey team I’ve seen execute is the logo directly on top of the helmet. That “Y” on top of the helmet is what separates these from the pack. I think that it’s a risk putting that mark there, but it’s wide enough to look good and make a different. We’re still a ways off from the midway point, and it’s already getting difficult to get nitpicky. 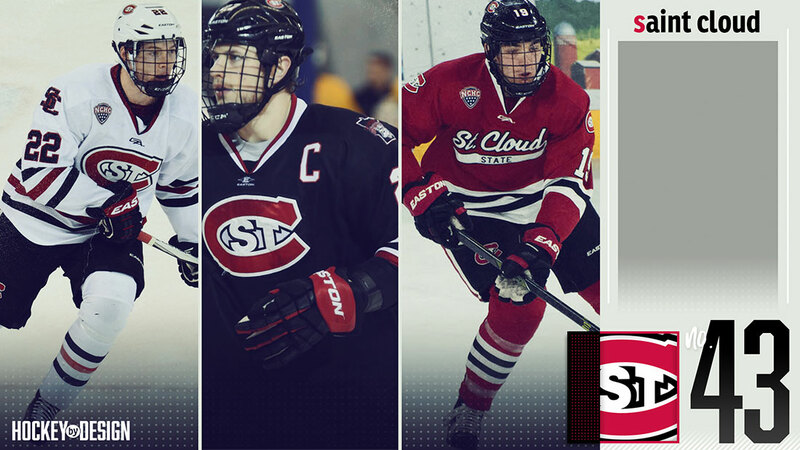 Saint Cloud’s overall look and brand is top-notch. My biggest grip about Saint Cloud is what they don’t have: the script jersey in black and white. Let’s start with the reds. I’ll say it again: script and college hockey are like peanut butter and jelly. It just works. I love the white script font, stroked in black with the word “STATE” in the under script of St. Cloud. Very, very cool and unique. My only major beef with these is that for the amount of striping at the bottom of the jersey, a la the Chicago Blackhawks, I’d almost say a plain pant or a one-color stripe would suffice, but that’s about it. Everything else with it is great. Having said all of that, I still like the white and black offerings the Huskies trot out. If I had to pick, I’d say the black uniform stands out to me more because I really like how the piping on the sleeve works. A two-prong system that uses negative space to create a well-placed unique pattern. The white uniform is strong, but you see the three-stripe piping model a lot of times with other teams. The other thing I prefer on the black uniform versus the white is the Minnesota outline on the shoulder patch versus the blocky ‘SC’. The logo on the front of the black and white uniforms are fine, obviously very emblematic of the Montreal Canadiens, but I think it serves better as a smaller mark on the shoulder, helmet or pant. Alaska Anchorage is a long way from Boston, but that doesn’t mean I can’t envy that iconic logo from afar. Truth be told, if it was not for that definitive Seawolves logo that just screams Alaska, I’d probably have these uniforms ranked lower. I don’t usually like to have the logo of a school or team weigh so heavily on a uniform, but branding and the collegiate look and feel that mark levies cannot be replicated. It is such a beautiful mark that speaks for itself and I really wish the dark uniform mimicked the white one because of it. In regards to all the trimmings on both sets, I don’t have any major issues with either set. They’re pretty generic and don’t necessarily take away or add to the overall aesthetic. I’m not the biggest fan of that oval shoulder coverage, but it’s better than just the empty trimming. If the Alaska Anchorage only had the offering of the black uniform in the white version, the Seawolves would be toiling much more towards the bottom. 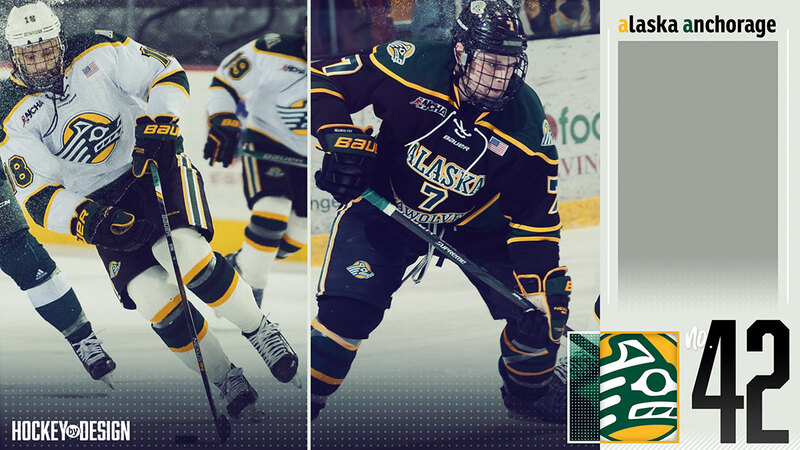 The two-toned stroke on both the team name and number is a lot to look at, and frankly I think it’s pretty clunky, but like I said, that Seawolves logo fashioned front and center on the white uniform is iconic and powerful that I have Alaska Anchorage up fairly high on the second-tier of college hockey uniforms. Bemidji State embodies the term ‘less is more’. You see, some people might take a look at this and say “how is it any different than Yale or Nebraska Omaha?” Well two things: there are no ties in these rankings and these are MY rankings and this is how it shook out. Sure, there’s nothing to write home about what the Beavers have to offer, but these are clean, they’re collegiate and I know exactly whom I signed up to play when they step onto the ice. The two-tone system is in full effect for the Beavers and I appreciate the green and white solid look. The other different aspect of these is the thick one-stripe band that’s patterned throughout on the sleeve and the bottom of the jersey. You don’t get that too often and I think for a team like Bemidji, it makes them stand out a little bit. I also appreciate the opposing collar coloring which gives these kits just enough differentiation from the other plainer looks. The one aspect of the uniform I don’t necessarily care for is the kind of ‘sandwich board’ look these have. The wordmark and number, although very easy to read which is what SIDs care about the most, is rather large. There isn’t too much space between those three lines and is a bit cluttered, but I appreciate that Bemidji State is on there as a whole. These are a prime candidate for a script font jersey…just sayin’. The final aspect of this look that I enjoy is the Beaver logo on the shoulder. This is one of those instances where I would shudder if it were blown up and placed largely in front. 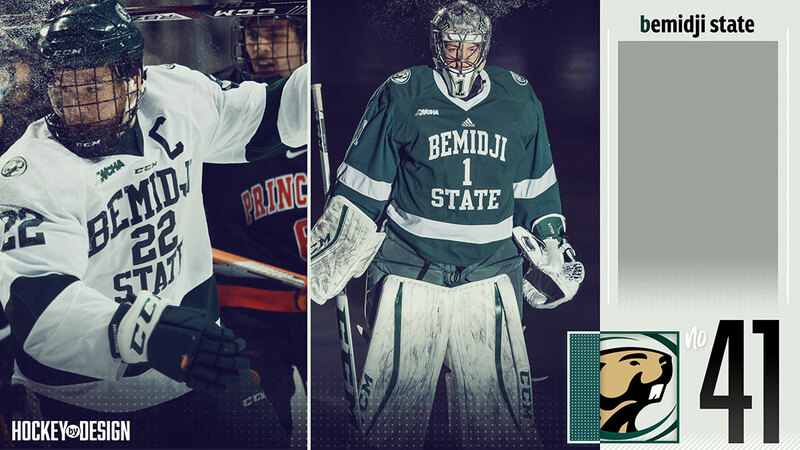 It’s too intricate and non-symmetrical of a logo to place front and center, so I applaud Bemidji State from being tempted to try and pull that off.